Whether you’re a resident of La Ciudad Condal or just passing through, follow these life hacks to make your life easier. Not only will you save time but you’ll also have an all-around authentic and enjoyable experience in Barcelona. At first sight, Barcelona might seem enormous, but after a while it is easy to learn to appreciate just how small and accessible the city is. The best advice for someone moving here: Walk. Walk everywhere. Aside from the obvious health and financial benefits, you’ll get to know the city so much faster this way, and there’s no better city in which to get lost. Wander and roam the barrios as far as your legs will take you. Another great way to explore the city is by Bicing. 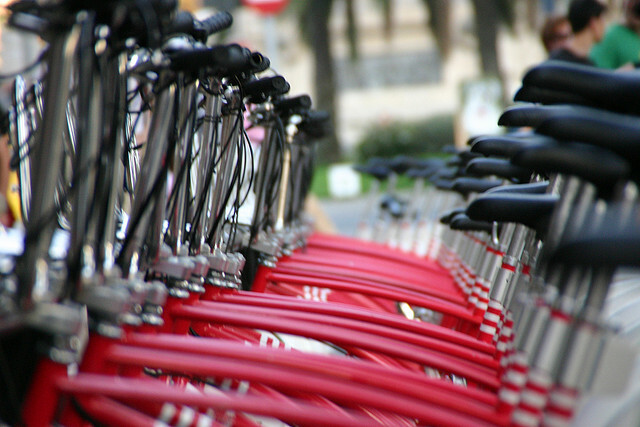 Bicing is a simple, practical and sustainable system for bike sharing in Barcelona that allows you to travel wherever you want, whenever you want. It works on a similar basis to other European schemes such as Velib in Paris or the affectionately named Boris Bikes in London. With a network of over 400 bike stations now operational across the city, you’re never more than 300 meters away from a Bicing station, taking the hassle out of navigating around an unfamiliar city. The Metro system in Barcelona is reliable and frequent, and compared to public transport in most major capital cities, the service provides very good value for money. Watch out for gimmicks, though. You will see, for example, multi-day passes such as the ‘Barcelona Transport Card’ being advertised to the public (especially tourists), but they aren’t really a very good deal. You’re better off buying a T10 ticket. With a T10 ticket, you can transfer between bus, tram or metro, and it will only deduct one trip from your card, so long as your trip is no longer than one hour and 15 minutes. Don’t fight it. Eat when the locals eat and sleep when the locals sleep, or you might go mad. If you’re one of those dinner-at-5pm people, then brace yourself because most places will have closed after the lunchtime rush at that time. At 6pm, they’re having a merienda (mid-afternoon snack), and dinner tends to be between 8pm and 11pm. Drinks might start at 11pm or midnight. And if you’re going clubbing, prepare to not leave the house until 1am. Barcelona is not a violent city, but there is a lot of petty crime, especially incidents related to pickpockets and fraudsters. There’s no need to be paranoid, but do be cautious. Use your common sense. Leave valuables at home, watch your handbag at all times and don’t leave your mobile on the table. If someone gets too close, be wary. Try to avoid giving people directions and watch out for ‘good samaritans’ offering to help clean up a ‘sudden spillage’ (coffee, phantom pigeon mess, etc.). Be firm and say ‘no.’ They’ll go away. 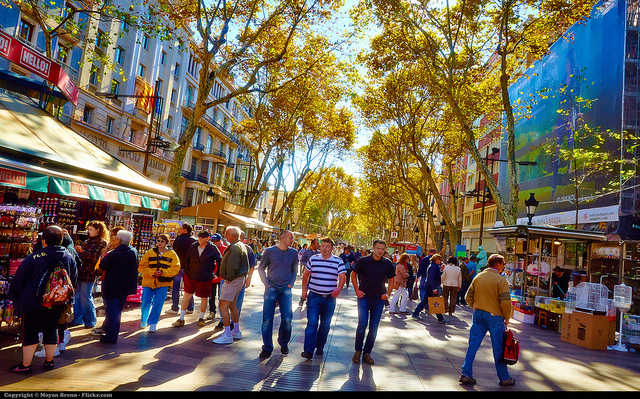 Pickpocket hot spots include the metro system, Las Ramblas, Plaza Real, Plaza Catalunya and the beach. Don’t wear your $2000 camera around your neck. Wrap your handbag around your waist. Be subtle with your map reading. If a stranger is being overly friendly or getting too close, be suspicious. 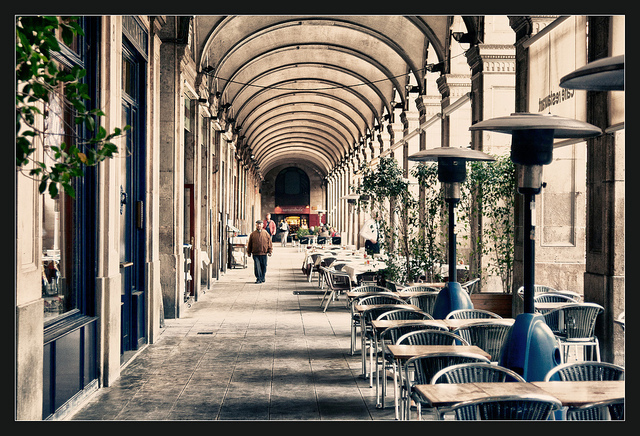 Unless you receive exceptional service and feel it’s necessary, there’s no obligation to tip in Barcelona. This goes for taxi drivers, bartenders, servers, hairstylists, etc. If you do want to leave something, leave a few coins from your change. Times are hard. Save your cents. Bags and bread are not free in Spain. Bring reusable bags to supermarkets and think twice before nibbling away at those rolls the ‘kind waiter’ just plonked on your table, unless you’re happy to pay. Very little is ‘complimentary’ in this city. Public libraries in Barcelona offer a wide selection of books in English, not to mention free WiFi, public bathrooms (a rarity here), quiet study rooms, DVDs and, in many including Lesseps, exchanges (intercambios) for language learners. Find your local library and sign up! 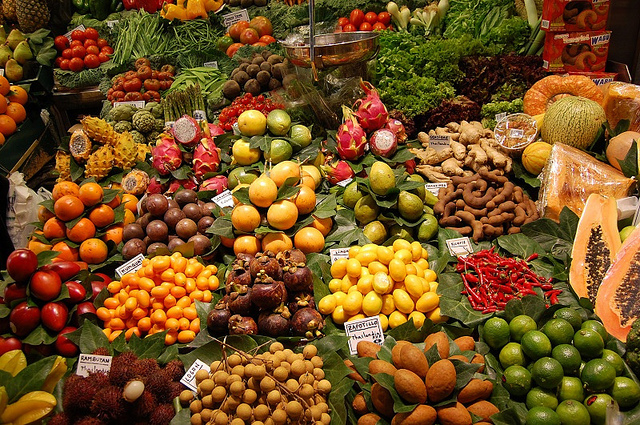 Barcelona is host to a huge selection of supermarkets. Mercadona is the cheapest overall, closely followed by Alcampo, and they are usually better value and sell higher quality products than the likes of Sorli Discau, Bon Preu, Suma, and Dia. Better still, shop at your local market and get to know the locals. The Costa Brava is home to some of the most beautiful beaches in Europe. Although Barcelona beaches are great for taking in the sea air, you really need to leave the city to appreciate what it has to offer. You don’t need to go far. Platja d’Ocata is only a ten-minute train ride from the city center. Certain areas of the city have become a veritable paradise for the ever-growing masses of vintage-chic aficionados. Carrer de la Riera Baixa in the Raval is one such place. A vintage store mecca, you could spend hours digging through all of the delightful wares its shops have to offer. Hunt for classics in the old record stores, explore the curiosities of the numerous military and collectible stores and pop into the local retro hair salon to update (backdate?) your look with a retro hairstyle. Looking for a hipster hangout spot for your afternoon Vermouth? Try Calle Parlament in Poble Sec. It’s where all the cool kids hang out now. If you live in Poble Sec then you’re lucky enough to have Montjuic right on your doorstep. It cannot be stressed enough what a luxury it is to be able to escape the city and dive into nature at the drop of a hat. Aside from the tourist hot spot that is Castell de Montjuïc (which now charges an entrance fee), you’ll find an array of manicured gardens, ornate fountains and breathtaking views of the coastline and city. Explore the maze of pathways and lose yourself for a few hours. It does wonders for your stress levels. If you plan on staying here for a while, nothing will help you feel more at home than learning the local language. The Consortium for Linguistic Normalization (CPNL), a sector of the government of Catalunya, is responsible for preserving the Catalan language, and by consequence, they offer free language courses to native and expat residents of the city. Sign up for your free course here. Barcelona boasts the biggest free public WiFi network in Spain and one of the biggest in Europe. Barcelona WiFi is a Barcelona City Council service that enables you to connect to the internet through WiFi access points, or hotspots, located in various municipal amenities and public access points. Another free WiFi option is GoWex, a Smart City initiative that can be found at most local street kiosks. Finally, most bars and restaurants offer free WiFi. The perfect excuse to grab your laptop and move your office to the local cake shop. Check the date before you visit a museum. Many of Barcelona’s best museums offer free entry once a month, including the Museu Nacional d’Art de Catalunya (MNAC), Museu Picasso and Museu d’Història de Barcelona (MUHBA), and others offer free admission every Sunday between 3pm and 8pm. Check the date before you go, and save yourself a few euros. Barcelona can be a very budget-friendly location if you know where to look. There’s an ever-growing culture of free activities on offer which, coupled with year-round good weather, make it very difficult to claim there is ‘nothing to do.’ From flea markets to festivals to music and cultural events, there’s something for everyone. You don’t need to break the bank to have a good time. No one to go with? Join a Meetup group and make new friends who share your hobbies.